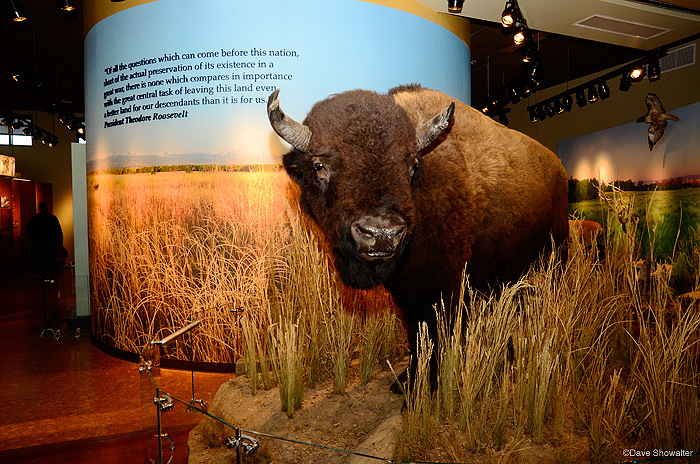 Rocky Mountain Arsenal NWR will open their new LEED Gold visitor center on May 21, 2011. I contributed many images to the exhibits, including two murals that I was commissioned to make for the larger exhibits. This fall diorama is 11 x 26 feet and is the first thing that visitors see when entering the building. I was told that the exhibit and backdrop would be the showcase for the premier refuge visitor center in the region and I'm proud that it turned out so well. I made the diorama with twelve vertical images that I later stitched with Photoshop in my home studio. Once I had the raw image assembled, I made a number of contrast and color adjustments to make the image look good with nice saturation of the autumn grasses. The image was made with a lot of sky for the Teddy Roosevelt quote, something I planned for in the field. Things got really interesting when I used OnOne Software's Genuine Fractals to up-res the image to the giant size. I reduced the resolution from 300 dpi to 100 dpi to effectively triple the image size before up-res. My Mac Pro computer churned and too some time to output this massive file that I previewed on a 23" display. It's quite gratifying to see the final product. Photo © copyright by Dave Showalter.